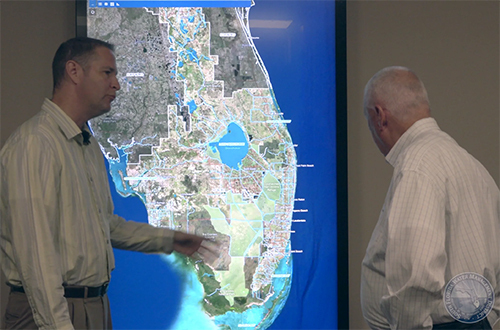 West Palm Beach, FL – The South Florida Water Management District (SFWMD) this week unveiled its latest tool to inform the public about the ongoing efforts to alleviate the high water emergency caused by record rainfall throughout South Florida. The new website, www.sfwmd.gov/managinghighwater, will contain weekly video updates from SFWMD Chief Engineer John Mitnik on the latest water conditions and measures implemented to lower lake levels and move more water through the conservation areas. To view the latest update filmed this week, click HERE. The Managing High Water web page also contains more detailed information on the ongoing efforts to protect the public and the environment after 300 percent of the average amount of rainfall fell throughout South Florida in May. This record rainfall caused Lake Okeechobee to rapidly rise more than a foot, which led the U.S. Army Corps of Engineers (USACE) to begin releases from the lake on June 1 to the northern estuaries to ensure flood protection for the citizens that live south of the lake. At the same time, this record rainfall inundated the water conservation areas, causing them to rise above their regulation schedules. In response to this record rainfall, Gov. Rick Scott directed the Florida Department of Environmental Protection to issue an emergency order which expedites the ability of SFWMD and other agencies to take action to lower water levels in the conservation areas, creating capacity to take water from Lake Okeechobee to reduce the need for estuary releases. SFWMD Chief Engineer John Mitnik joins SFWMD spokesman Randy Smith on June 27, 2018, to provide an update on water conditions throughout South Florida and ongoing actions being taken by the District to lower Lake Okeechobee levels and move more water through the Water Conservation Areas.